The Nissan NV200 is a light commercial vehicle produced by Nissan. The vehicle was unveiled in 2007 Tokyo Motor Show (with a remote control panel for a spider camera, equipment for organizing and editing photographs and images while on assignment), followed by 2008 NISSAN TENJIN MOTOR SHOW. Available in Combi and passenger car versions, NV200 was built on a modified version of Nissan's B Platform, with fully independent strut type front suspension mounted on a separate subframe and a leaf spring rear axle. The vehicle was unveiled in 2009 Geneva Motor Show, followed by 2010 Beijing International Automobile Exhibition. The vehicle went on sale in Japan before summer 2009, followed by Europe in autumn 2009 and then in China and other markets. China model went on sale on June 18, 2010. Early models include HR16 DOHC (83 kW/150Nm) engine. Sales of European models of NV200 van and combi began from October 2009 in most European markets, followed by Family version in 2010. Early models include 1.6-litre HR16 (108PS) petrol or 1.5 dCi (K9K) 1,461cc (86PS) diesel engines, five-speed manual transmission, optional rear view parking camera. Available in Van DX light commercial van and Wagon 16S people carrier, it is a version of Nissan NV200 replacing the older Nissan Vanette. The vehicle went on sale on May 21, 2009 in Japan, followed by other markets around the world. Early Japan models included Van DX (2/5-person), Van DX route van (2-person), Van GX (5-person), Wagon 16S (7-person). NV200 Vanette Chair Cab is a version of FWD NV200 Vanette with wheelchair entrance at rear hatch, automatic transmission. NV200 Vanette Enchante step type is a version of FWD NV200 Vanette with electric slide step. Japan models went on sale on September 7, 2009. Early models include 16S. 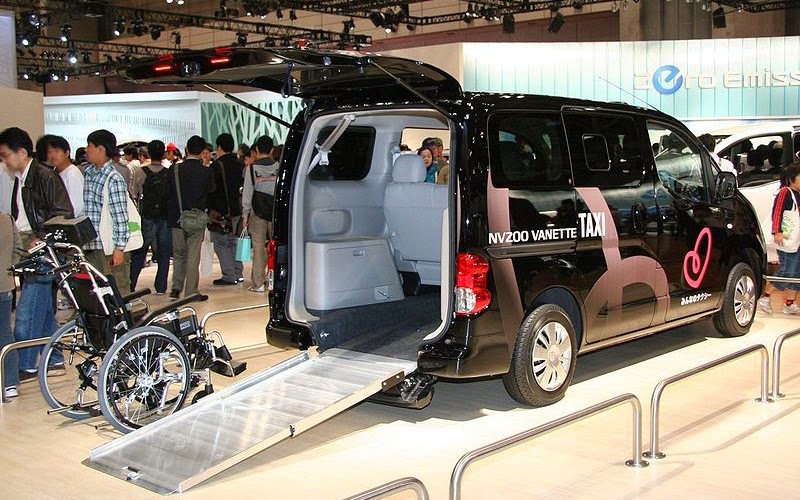 It is a version of NV200 Vanette taxi designed to provide comfortable mobility for all customers. The vehicle was unveiled in 2009 Tokyo Motor Show. The vehicle was set to go on sale at the end of 2010. Changes to NV200 Vanette Van include the addition of Van VX (2/5-person) and Van GX (2-person), addition of coloured bumper, full wheel cover, power windows, moon roof trim as standard on Van DX. Japan model of NV200 Van went on sale in 2010-12-07. Early models include Van DX (2WD) (2/5-person), Van DX route van (2WD) (2-person), Van GX (2WD) (2/5-person), Van VX (2WD) (2/5-person). 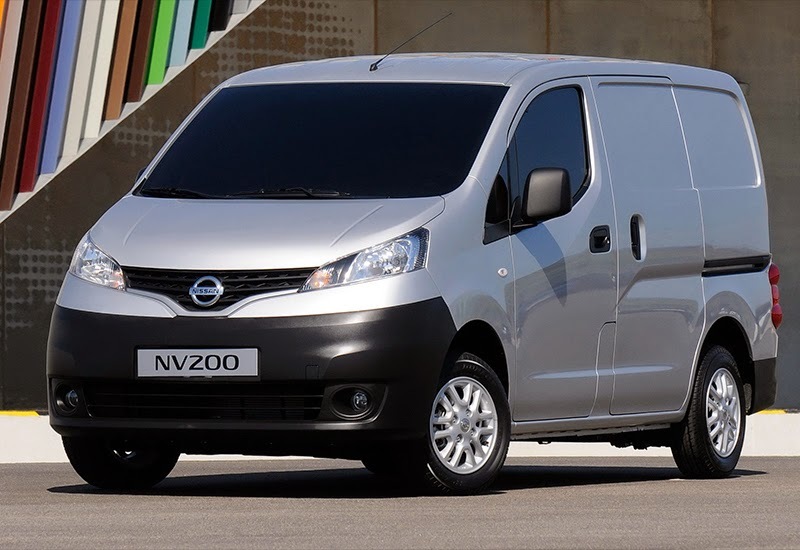 They are versions of Nissan NV200 sold by Mitsubishi Motors Corporation, with 1.6-liter straight-4 engine. Japan models went on sale in 2011-10-27. Early Delica D:3 models include M (5-person), G (7-person). Early Delica Van models include DX (2/5-person) (5MT/4AT), GX (2/5-person) (4AT). This is a version of Nissan NV200 with 2.0L 4-cylinder engine, a low-annoyance horn with exterior lights that indicate when the vehicle is honking, sliding doors with entry step and grab handles, transparent roof panel (with shade), independently controlled rear air conditioning with a grape phenol-coated air filter, breathable, antimicrobial, environmentally friendly and easy-to-clean seat fabric that simulates the look and feel of leather; overhead reading lights for passengers and floor lighting to help locate belongings, a mobile charging station for passengers that includes a 12V electrical outlet and two USB plugs, a six-way adjustable driver's seat that features both recline and lumbar adjustments, even with a partition installed; standard driver's navigation and telematics systems; front and rear-seat occupant curtain airbags, as well as seat-mounted airbags for the front row; standard traction control and Vehicle Dynamic Control (VDC), lights that alert other road users that taxi doors are opening. 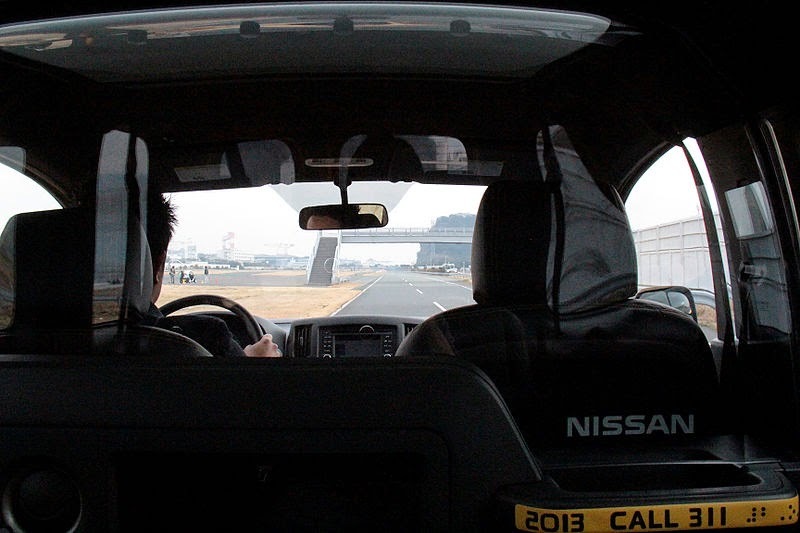 The vehicle was unveiled in 2011 Nissan Taxi of Tomorrow Design Expo, followed by 2012 New York International Auto Show, Nissan's Yokohama headquarters, 2012 Paris Motor Show. Based on the Nissan NV200, Nissan introduced the Nissan e-NV200 concept all-electric van at the 2012 North American Auto Show in Detroit. The e-NV200 has a 24 kWh battery pack that is expected to have a range similar to Nissan Leaf of 73 mi (117 km). Trials with a prototype were conducted with Japan Post Service beginning in July 2011, followed by trials with FedEx in London starting in December 2011, AEON Retail Co., Ltd., FedEx Express in Yokohama Area, Tochigi prefectural government in prefecture's rural areas from 2012-09-03. More testing with a more advanced pre-production version, unveiled at the 64th IAA Commercial Vehicle International Motor Show in Hanover, took place in Singapore, the UK, the U.S. and Brazil, Coca-Cola Central Japan Co. starting in mid-November 2012, FedEx Express in Singapore, Saitama City, DHL Japan in Tokyo Metropolitan Area. A more extensive 6-month trial with 28 units delivered to British Gas began in the UK in November 2013. The Evalia was launched in India on 27 September 2012. This new MPV from the stables of Nissan Motors is slotted in between the Maruti Suzuki Ertiga, which was launched in India in the month of April and has managed to make a mark in this segment, and the Toyota Innova, which is tagged as the bestselling MPV for a long time now. Maruti Ertiga’s highest selling point is its low price that has set the ball rolling for the new compact MPV in the Indian car market. Changes include strengthened sliding door, 3-point seat belt for 2nd row centre seat passenger in NV200 Wagon. Japan model went on sale in 2012-06-08. Early models included Van DX (2/5-person), Van DX route van (2-person), Van GX (2/55-person), Wagon 16X-3R (7-person), Wagon 16X-2R (5-person). Nissan NV200 London Taxi was developed in London by Nissan Design Europe in Paddington. Changes include unique front direction indicators at the lower half of the bumper sitting further towards the outer edges of the vehicle and are integrated with LED daytime running lights, a specially-developed roof sign approved by Transport for London (TfL), side windows that extend the full length of the vehicle, twin sliding doors, enlarged left-hand door aperture (30mm increase in width, 20mm in height) to meet the requirements of wheelchair users, twin loading doors split 70/30, cabin with separate driver and passenger compartments, five-seater layout with three-seat rear split rear bench mounted on runners, sliding rear seat, TfL approved seating access and controls, modified front suspension with a separate steering knuckle connected via swivel bearings, wider track allows for the turned wheel to clear the inner wheel arch, modified steering rack and double Cardan driveshafts that incorporate two universal joints, sub-frame that connected to the vehicle with compliant rubber mounts, rear double-elliptical leaf springs, 1461cc (89/110PS) dCi (K9K) turbodiesel engine, 5-speed manual (89PS) or 6-speed manual (110PS) transmission. The vehicle was unveiled in London, followed by 2012 Paris Motor Show. The vehicle was unveiled in 2012 Chicago Auto Show. US models went on sale at Nissan Commercial Vehicle dealers beginning in early 2013 as 2013 model year vehicles. Early models include 2.0-liter 16-valve 4-cylinder engine, Xtronic CVT. Changes to NV200 Vanette Taxi and Autech NV200 Vanette Chair Cab include strengthened engine valve and valve seat, support for LPG fuel. Japan models went on sale in 2013-04-01. Early models include HR16DE engines, automatic transmission. It is an Ashok Leyland version of Nissan NV200. Indian model went of sale in September 2013. Early models include 1.5-litre K9K (86PS) engine, 5-speed manual transmission. It is a version of NV200 Vanette with LPG fuel support, 45.5L(38.6L fuel capacity) LPG tank. Japan models went on sale in 2013-08-30. Early models include 1600 LPG bi-fuel engine, automatic transmission, 5 seats. Production model was unveiled in 2013 Matsuya Ginza's 'New York Week' fair. The vehicle went on sale as 2014 model year vehicle. The vehicle entered the New York City's taxi fleet near the end of October 2013. However, New York Supreme Court Justice Peter Moulton ruled that the deal between NYC and Nissan was "null, void and unenforceable" since the NV200 is not a hybrid. In addition, Manhattan Supreme Court Justice Schlomo Hagler ruled the Taxi and Limousine Commission exceeded its authority for mandating the city's taxi fleets be replaced by Nissan NV200. That ruling was overturned by a New York appeals court on June 10, 2014, with Justice David B. Saxe finding that the commission's mandate was in fact legal. It is a version of NV200 New York City taxi with rear ramp for wheelchair access, integrated restraint system for securing of wheelchairs. The vehicle was unveiled in 2012 New York International Auto Show. 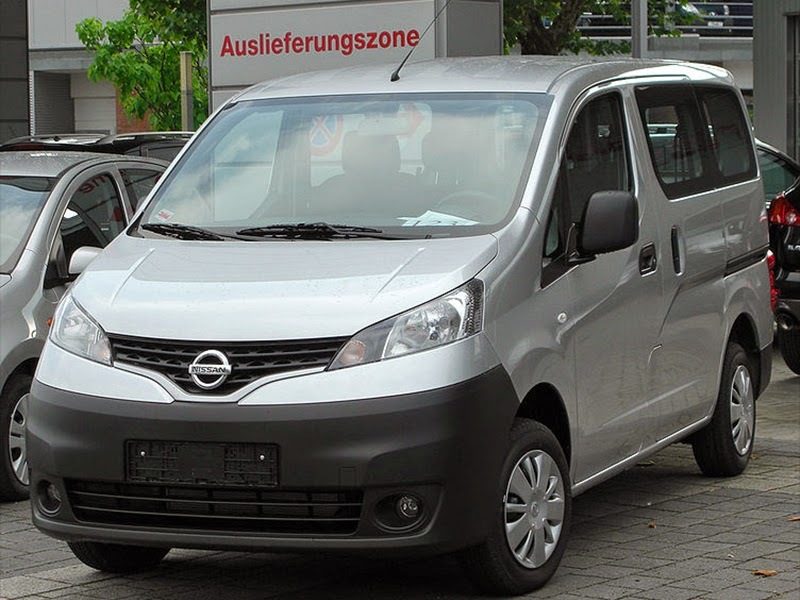 US models of 2014 Nissan NV200 Compact Cargo went on sale in January 2014. Early models include S and SV. Nissan e-NV200 concept presented at the 2012 Geneva Motor Show. The Nissan e-NV200 is the all-electric version of the utility van. Trials with Japan Post Service began in July 2011, followed by trials with FedEx in London starting in December 2011. More testing with a more advanced pre-production version took place in Singapore, the UK, the U.S. and Brazil. A more extensive 6-month trial with 28 units delivered to British Gas began in the UK in November 2013. The pre-production version of e-NV200 was unveiled at the 2013 Tokyo Motor Show. The production version of the e-NV200 was unveiled at the 2014Geneva Motor Show. The production version of the e-NV200 has 30% of new components compared with the internal combustion NV200. The electric van has the same 24 kWhlithium-ion battery as the Nissan Leaf, and is capable of delivering an all-electric range of 170 km (110 mi) under the New European Driving Cycle (NEDC) test. Launched in June 2013, the car was scheduled to go on sale in Europe in the same month and in Japan in October. Pricing in Germany will start at €25,058 (~ US$34,958). Gasoline engine version of Nissan NV200 London Taxi includes Nissan-sourced 1.6-liter gasoline engine, automatic transmission. Gasoline engine Nissan NV200 London Taxi launch was set to begin in December 2014, followed by Nissan e-NV200 London Taxi in 2015. It is a version of Nissan NV200 for United States market. It will also be marketed alongside the NV200, but separately, in the Canadian market. Chevrolet plans to target the vehicle towards the business sector and will be slotted below its full-size Express van. The City Express will come in two level trims (LS and LT), a fold-down passenger seat, 40/60-split rear cargo doors that open to 90- and 180-degree angles, left- and right-side sliding doors, twenty integrated cargo-mounting points throughout the interior, six floor-mounted D-rings and a center storage console. The LT trim will include a 5.8-inch diagonal touch screen, navigation, Sirius XM Radio, and Bluetooth connectivity as part of their technology package. The latter is also optional on the LS trim. The vehicle will make its debut at the 2014 Chicago Auto Show and is set to go on sale in the fall of 2014. The NV200 Combi received a three-star EuroNCAP score in May 2013. EuroNCAP commented of the adult occupant: "When the car was inspected after the frontal impact test, it was found that the floor panel had torn away from the base of the A pillar and numerous spot welds had released between the floor and sill...the main body of the sill was found to be bent inwards. The passenger compartment was judged to be unstable and the car was penalised. Similarly, the driver's footwell was found to have ruptured and was unstable and a further penalty was applied." 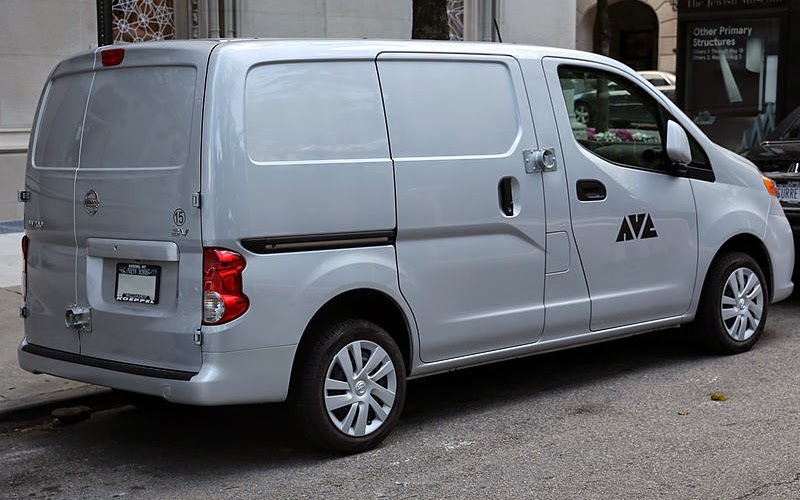 European models of NV200 were produced in Japan, until production started at Nissan's plant in Barcelona in November 2009. 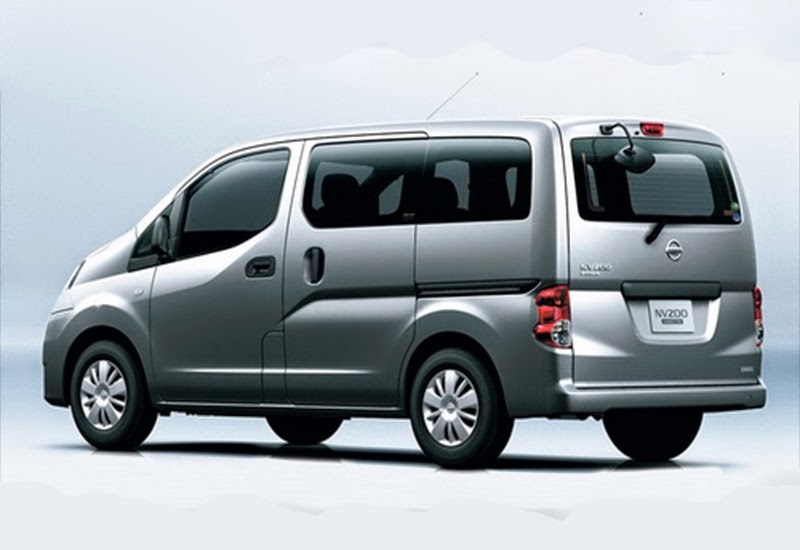 In China, the NV200 is built by Nissan in partnership with Dongfeng Motor, and was released in June 2010. An electric vehicle based on NV200 is planned. The Nissan NV200 New York City taxi was built in North America at Nissan's facility in Cuernavaca, Mexico. Conversion of NV200 Mobility Taxi was done by Indiana-based BraunAbility. Nissan Motor Co., Ltd. loaned 10 units of NV200 Vanette Taxi at no cost to several taxi operators in the Tohoku region of Japan to help improve public access to transportation in the areas affected by the recent major earthquake and natural disasters, with delivery began in fall 2011. As of August 30, 2013, sales of Nissan NV200 reached 170,000 units. The first buyer of Nissan NV200 New York City taxi was medallion number 7F20 owner Ranjit Singh, with delivery of taxi from Koeppel Nissan in Queens on 2013-10-18, and first 1-passenger fare service performed from JFK International Airport on 2013-10-23 to near 13th Street and 6th Avenue in Manhattan. 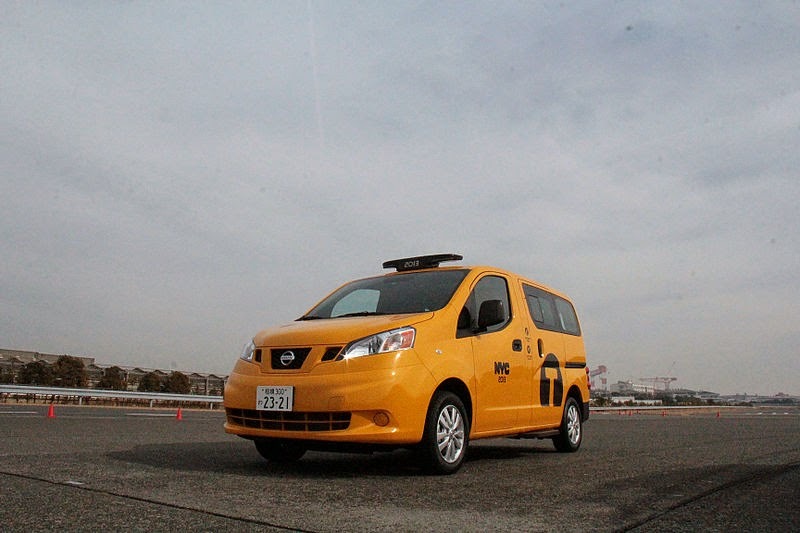 As of December 16, 2013, Nissan was in the process of distributing the first 200 units of NV200 New York City taxi to dealers across New York City. The company is also delivering another couple hundred new taxis to dealers in Seattle, Los Angeles, Salt Lake City and Texas. Production of Nissan e-NV200 was scheduled to begin in Barcelona, Spain, by mid-2014 at Nissan’s plant in Barcelona, Spain in mid-2014. The Coventry-based ADV Manufacturing Ltd was responsible for the engineering, development and final assembly of Nissan NV200 London Taxi. The Nissan e-NV200 was expected to be available by 2017 for the NYC Taxi of Tomorrow fleet. In April 2010, it was named the Professional Van and Light Truck Magazine Van of the Year 2010. The Nissan was announced as the winner of New York City's Taxi of Tomorrow, beating finalists Karsan V-1 and Ford Transit Connect. Nissan was awarded a 10-year contract to provide the city exclusively with some 13,000 yellow cabs, starting in 2013. The European version with the 1.5L Diesel four-cylinder gets 54.4 averaged mpg (44 miles per US gallon); however, the American version will obtain fewer miles per gallon. TaxiTV: Taxi passengers will receive a video message from Nissan urging them to say #HailYes when they ride in New York City cabs. The message will run through the end of the year. Online Advertising: Media banners will run on different properties that New Yorkers trust for news. Each banner will provoke the audience to say #HailYes to the series of improvements that the NV200 taxi brings New Yorkers. Outdoor Advertising: Two #HailYes billboards were erected above the streets of Manhattan including the most prominent Penn Station board – standing above the busiest taxi stand in New York City. The other board is in Times Square. Facebook and Twitter: Online consumers will be encouraged to say #HailYes to the Nissan NV200 taxi through promoted Facebook and Twitter posts geotargeted for New York City. Nissan's Facebook and Twitter pages will also carry the #HailYes banner. Last updated on 15 July 2014 at 00:49.